The headline-grabbing story of Apple’s quarter to the end of December 2014 is very much the record-breaking money: $75bn in revenue and $18bn in net profit. But within the results is a rough indication of the health of the product the music industry is most interested in: iTunes. MBW has learnt that iTunes showed growth in Apple’s Q1, generating a total of $2.6 billion in net sales during the quarter, compared to $2.4 billion during the first quarter of 2014. However, that included app sales, which were the main driver for the growth, alongside an increased volume of in-app purchases. Income from iTunes – including apps and entertainment – now makes up around 3.5% of Apple’s total revenue. The news for entertainment products wasn’t as rosy as it was apps, however. Although Apple doesn’t break down music’s performance specifically, iTunes saw a 7% year-over-year decrease in net sales of digital media – consisting of music, movies, TV shows and e-books – in the period. Total market digital album downloads decreased by 9% in the UK last year, and by the same percentage figure in the US. The industry is now awaiting the worldwide launch of Apple’s Spotify rival, Beats Music. Interesting to note that in the half-hour earnings call that followed Apple’s announcement of its record profits this week, the word ‘music’ wasn’t used once. 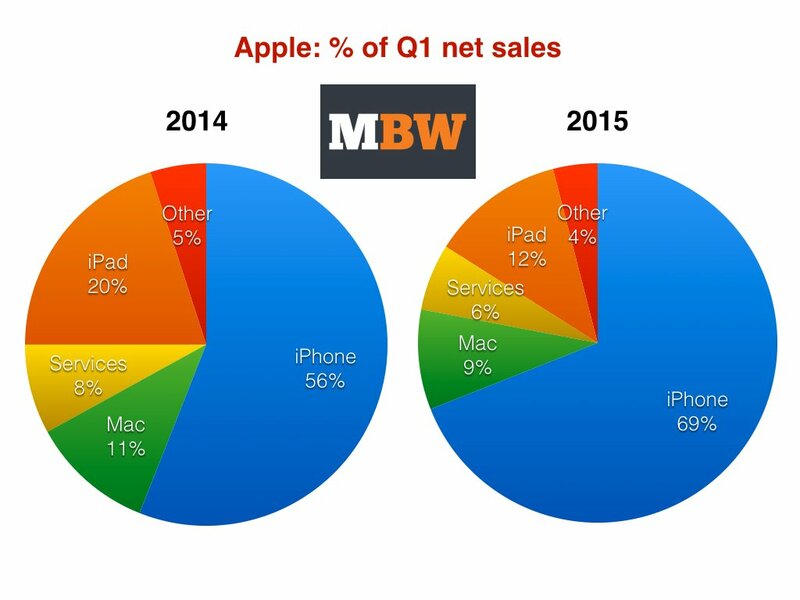 As you can see in the graphs below, Apple’s iPhone business now makes up 69% of its total revenues in its Q1 (the three months to end of December 2014). ‘Services’ covers revenues from iTunes, AppleCare, Apple Pay and licensing.